Atletico Madrid's bid to win La Liga for the first time since 1996 took a blow as Levante beat them to give Real Madrid and Barcelona renewed hope. The Champions League finalists trailed after just seven minutes, when left-back Felipe Luis deflected in Levante midfielder Pape Diop's corner. Atletico improved after the break but their defeat was sealed when David Barral coolly struck from eight yards. Atletico stay top and need four more points to win the title. But their lethargic loss at mid-table Levante has the potential to throw the three-way title race open once again. Atletico know they cannot be caught by either Real Madrid or Barcelona if they earn at least a win and a draw from their final two matches. They host Malaga next weekend before going to Barca's Nou Camp on the final day. Third-placed Real, who drew 2-2 against Valencia later on Sunday, are five points behind Atletico but have a game in hand, although Atletico would be crowned champions if the teams finish level on points given their superior head-to-head record. Barcelona, who are second, are three points adrift of the leaders, with both sides having played 36 matches. The Catalan club could pip Atletico on their head-to-head record if they beat Diego Simeone's men on 18 May. Atletico, who will meet city rivals Real in the Champions League final, lacked their usual spark and energy as Levante frustrated them from the first whistle. The Valencia-based side took an early lead when Filipe Luis diverted Diop's set-piece out of Atletico keeper Thibaut Courtois's reach and into the bottom corner. Simeone made a double substitution at half-time, introducing winger Ardan Turan and forward Adrian, as he attempted to inject some life into his side. His players responded with a much-improved display in the opening exchanges of the second half. Turan was the main threat as Atletico upped the tempo, seeing two low shots blocked and sending an eight-yard header over. Top scorer Diego Costa had few clear-cut opportunities, but the Spain international was inches away from connecting with substitute Diego's in-swinging free-kick at the far post. Atletico continued to press as they sensed a vital breakthrough, but were denied again when Levante goalkeeper Keylor Navas acrobatically clawed away right-back Toby Alderweireld's long-range effort. 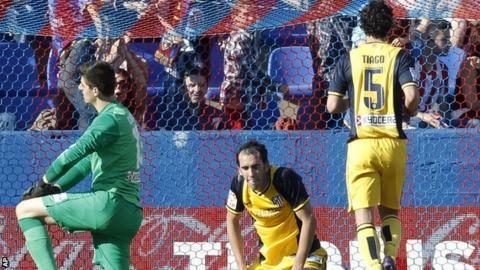 Levante were carrying little threat, but punished Atletico's profligacy midway through the second half. Ex-Real Madrid youngster Barral neatly controlled Victor's left-wing cross before firing past Courtois to revitalise his former club's title hopes. Match ends, Levante 2, Atlético de Madrid 0. Second Half ends, Levante 2, Atlético de Madrid 0. Corner, Levante. Conceded by Miranda. Attempt blocked. Andreas Ivanschitz (Levante) left footed shot from outside the box is blocked. Assisted by Pape Diop. Pedro López (Levante) wins a free kick on the right wing. Attempt missed. Sergio Pinto (Levante) right footed shot from the centre of the box is close, but misses to the left. Assisted by Andreas Ivanschitz. Attempt saved. Diego (Atlético de Madrid) left footed shot from outside the box is saved in the centre of the goal. Assisted by Adrián. Attempt saved. Arda Turan (Atlético de Madrid) right footed shot from the right side of the box is saved in the top centre of the goal. Assisted by Miranda. Attempt missed. Miranda (Atlético de Madrid) header from the centre of the box is just a bit too high. Assisted by Arda Turan with a cross. David Navarro (Levante) wins a free kick in the defensive half. Offside, Levante. Sergio Pinto tries a through ball, but Ángel is caught offside. Attempt missed. Tiago (Atlético de Madrid) right footed shot from the right side of the box is close, but misses to the left. Pedro López (Levante) wins a free kick in the defensive half. Attempt missed. Adrián (Atlético de Madrid) header from the centre of the box is just a bit too high. Assisted by Gabi with a cross following a corner. Corner, Atlético de Madrid. Conceded by Juanfran. Attempt blocked. Diego (Atlético de Madrid) right footed shot from outside the box is blocked. Assisted by Gabi. Substitution, Levante. Ángel replaces David Barral. Arda Turan (Atlético de Madrid) is shown the yellow card for a bad foul. Attempt missed. Tiago (Atlético de Madrid) right footed shot from outside the box is high and wide to the right. Assisted by Diego. Adrián (Atlético de Madrid) hits the right post with a right footed shot from the left side of the box. Assisted by Arda Turan with a through ball. Sergio Pinto (Levante) wins a free kick in the defensive half. Simao (Levante) is shown the yellow card for dangerous play.